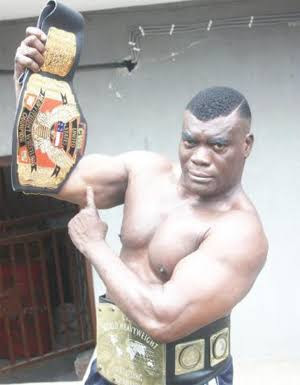 Nigerian wrestling champion, Power Uti has been arrested over the death of his wife, Toyin. Toyin passed away in their Ilupeju Lagos home. Her body was reportedly first discovered by Power Uti on Monday morning, who, instead of taking her to the hospital, went to a church to seek spiritual help. The deceased, 38, was a mother of four children who are under the ages of nine. She was unemployed and had been married for 10 years until her demise. Toyin’s remains has been deposited at the Isolo general hospital, while her four children have been placed under the care of her mother. Reacting, Police Public Relations Officer, Famous Cole said that Power Uti was being detained at the Ilupeju Police station. The spokesman said the case would be transferred to the Criminal Investigative Department, Panti in Lagos tomorrow (today).